Longwood Gardens in Kennett Square, Pennsylvania is an intriguing blend of history and nature. The land has long been inhabited as indicated by Lenni Lenape spears that have been discovered on the property. Centuries after the first settlers inhabited the area, Pierre du Pont purchased the land and soon began cultivating incredible gardens which would be the foundations of what we see today. 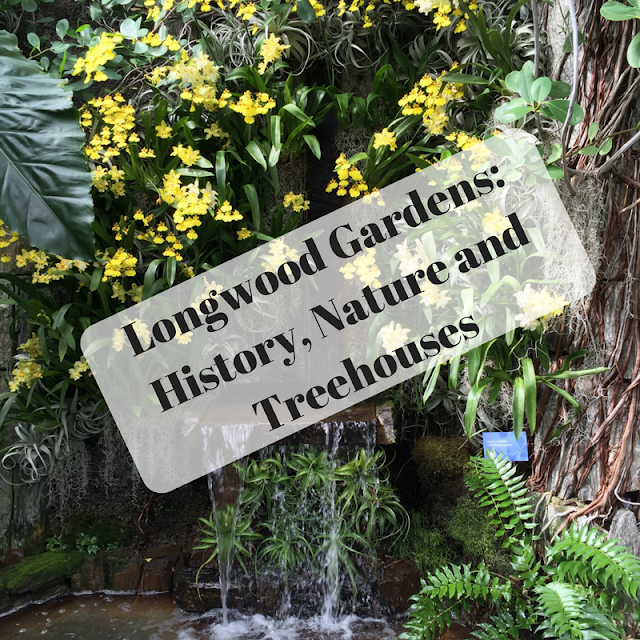 We visited Longwood on a relatively cold day. Good thing Longwood has some conservatory! In fact, Longwood has the largest conservatory I have visited. We could have spent the entire chilly and grey day there admiring the curated collections of blooms and greenery. Du Pont was inspired by grand gardens that he discovered throughout the world. He began the conservatory in 1916. I find it so remarkable that Du Pont created something so amazing and it still exists today. While there have been changes, du Pont's dream is still a treasure for the world to enjoy. Thanks to du Pont, the public can enjoy the tropics in the winter. Or we can enjoy a bonsai garden even when it rains outside. There is nothing like enjoying the tranquility of a waterfall ensconced with yellow blooms in winter! With du Pont's forward thinking, Longwood Gardens became a center for research, a place of learning and a garden of wonders for the public. In 1929, du Pont added a ballroom to the conservatory. The ballroom is kind of an interesting find in the conservatory and one that gives pause. While we visited, there was an organ demonstration going on. There is an Organ Museum component but we did not have time to explore on our visit. The children's garden area is actually quite sizable for a conservatory. There is a castle area complete with a bubbling cauldron. Water features throughout the children's garden beckon. The combination between foliage and play elements creates such a wonderland! I would love to return some time when the outdoor gardens are in bloom. We did venture out to see the treehouses which were explored top to bottom by my nieces and nephews. Climbing up treehouses is an automatic delight for kids. Each of the three treehouses is a different design with new things to discover. Unfortunately, the tree house that felt the most magical to me was not open. But, it was a delight to view. Another favorite discovery is the Peirce-du Pont House. The brick home was initially constructed in 1730 and expanded periodically afterwards. The historic Peirce-du Pont House with original portions from 1730. Inside, there is a small conservatory. While small, the conservatory was lovely and provided a nice place for a respite on a gray day. A little tropical delight on a cold day. There are a number of exhibits inside the home detailing the history of the area, how the gardens developed and the history of the du Pont family. Original cornerstone from one of the additions to the home. Travel Tip: Longwood Gardens is a popular nature spot to visit while visiting Philadelphia an up and coming US travel destination in 2019. 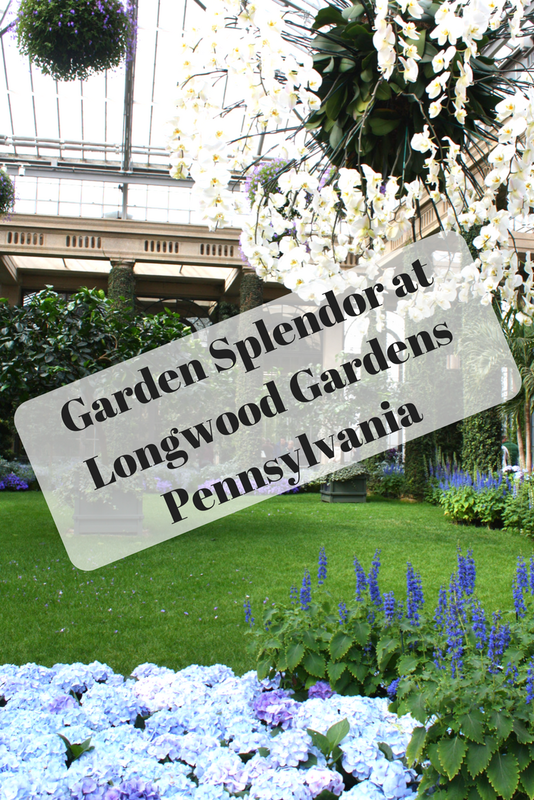 As you can see, there is an incredible amount to explore at Longwood Gardens. The nature haven is one that you can explore again and again enjoying different discoveries each time. I love that history and nature are truly blended into one here. We hope to return and see the nature splendor in a different season! There are a variety of events throughout the year including concerts and a Christmas light show. There are daily fountain shows during the warmer months. Several nights feature a spectacular firework and fountain show. The cafe has a wide variety of food. Everything we ate was of great quality. The gift shop has locally made items for purchase, so take a peek.